Ninja Star is one of the newest slot games to be released by Real Time Gaming casinos. This online video slot have 5 reels in 25 paylines that is based upon the ninjas of ancient Japan. Some of the symbols that will spin in the reels include a Ninja, Swords, Temples, a Ninja Star that acts as a scatter symbol and a Japanese character symbol. The Ninja Star scatter symbol and the Japanese character symbol are the symbols that players need to unlock the 2 bonus rounds the new slot game has in store for all that play this slot game. When 3 or more Ninja Star symbols land anywhere in the reels scattered about the online slot, the free games bonus round will commence. 8 free spins are given to the lucky player and best of all, all prizes from the free spins are tripled! During the free spins, scatters become wild which increase the chances of winning even more! When 3 or more of the Japanese character symbol fall in the reels from left to right the Ninja Scroll bonus round well start. Players will choose from scrolls that are presented to them in which multipliers will be awarded from 75, 100 or even 250 times! That is a massive bonus round! 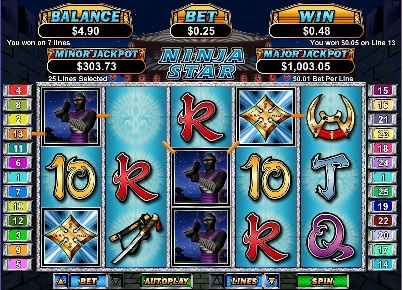 Ninja Star is a great addition to the assortment of online video slots that RTG casinos offer their players. This game seems to pay out rather well especially when the stacked Wild Ninja appears in any winning combination. It may be hard to spot a Ninja who is known for their stealth ways but players can find the newest slot machine at their favorite RTG casino like Sloto’Cash and Intertops.